Here he is in the Nursery. The children were very pleased to see him. He gave everybody an ice lolly and had a nice little chat with the children about Christmas. He wishes everybody at Robert Hitcham's a very Happy Christmas. The windows have been fitted this week and the builders have made good progress on the curved roof. Our Key Stage 2 Carol Service at St. Michael's Church, Framlingham. See below for video clips. The curved roof is lifted into place. A large crane was needed at school today to lift 4 very large pieces of wood into place. The wood was specially made in Denmark. These will form the curved roof on the new building. The Key Stage 1 Nativity this year was called 'The Little Angel'. The angel visits a number of Christmas scenes such as children eating , opening presents and a party. Eventually she she finds the really important event of the day - The BIRTH OF BABY JESUS. The Foundation (Nursery and Recption) Nativity Play 2007. The play was also filmed - a DVD will be available soon through the school office. The choir have been practising hard with Miss Hitchcock. Our annual Christmas Fair was held on Saturday. It was organised and run by the School Friends Association. The fantastic total of £2148 raised is being put towards the playground 'trim trail'. There was a wide range of stalls and activities including: White Elelephant, tombola, raffles, books, toys, face painting, tattoos, biscuit decorating, lucky lollies, treasure map, parent presents, soap snow men and cakes. Our caretaker Mr Jenkins also ran a 'Higher or Lower' game and won a prize himself as ' Best Dressed Stall Holder'. Many of the children organised their own games stalls. Thanks must go to the members of 'The Friends' who laid on refeshments throughout the day. The highlight of the day according to Georgia (reception child) was the visit of Father Christmas. He gave her a lovely sticker book and talked to her about Christmas. 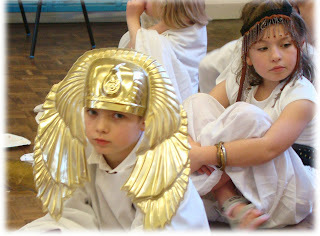 On Wednesday the children in Years 3 & 4 were involved in the much anticipated ' Egyptian Day'. This was an exciting day of eating, drama, singing and study. In the morning the children in groups prepared for the afternoon activities. They had to design their own pyramid, prepare an Egyptian meal, decorate temple pillars and organise entertainment. In the afternoon the children took part in a role play scene with the Pharoah visiting his people. Various children were ' executed' or sent to the salt mines. The highlight of the afternoon was when the Pharoah (Mr Hawes) fell off his chair.